Please contact The Rust Store at 1-877-256-9301 for pricing. The Rust Store distributes Cortec products to US customers only. 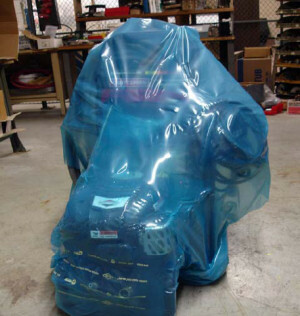 VpCI-126 shrink film eliminates the need for degreasing or coating removal required in the past! Cortec VpCI-126 Shrink Film, combines the latest film technology with the most effective corrosion protection for all of your metal products. Sealing your product in Cortec VpCI Shrink Film will protect a wide variety of metals from rust, tarnish, stains, white rust, and oxidation for up to 5 years. * It’s as easy as putting your product in Cortec VpCI- Shrink Film! Roll is 6 Mil and measures 20' x 100'. Each roll weighs 62 lbs. Cortec Product Code: 20807095. Cortec VpCI-126 Shrink Film can replace conventional rust preventatives such as oils and desiccants. You save even more because Cortec VpCI-126 Shrink film will eliminate all the degreasing or coating removal required in the past. Your product can now be used immediately. VpCI-126 is transparent, making it easy to identify parts. Additionally, it does not contain free amines, phosphates, or halogen-based materials and is non-toxic and recyclable. Metal parts packaged in Cortec VpCI-126 Shrink Film receive continuous protection against salt, excessive humidity, condensation, moisture, aggressive industrial atmospheres, and dissimilar metal corrosion. The Vapor phase Corrosion Inhibitors vaporize and condense on all metal surfaces in the enclosed package. VpCI reaches every area of your part, protecting its exterior as well as hard-to-reach interior surfaces. You get complete product protection during storage as well as during domestic and overseas shipments virtually eliminating any rust claims. Notes: This product should be stored indoors at ambient temperature, sealed within its original packaging. Under these conditions, shelf life is up to 24 months. *Depending on conditions and film thickness. Quantity Discounts Available for Large Orders. Please call us more information at 1-877-256-9301.